Drones have been flying around for some time. The hobby was bound to evolve. Gesture control is another style of flying that allows navigators to control the drone in the sky using hand motions. Some models allow fliers to manipulate drones via small remotes and smartphones too. Here’s what you need to know about gesture flying and why you should consider taking your flying to the next level. In short, gesture recognition means that the drone “understands” particular human gestures. So, if you wave your hand over to the left, the drone will hover that way. More advanced gestures apply such as having a drone land in your palm. Wary souls don’t have to worry about limitation. Users can still fly drones using smartphones or a small hand remote. More people are registering drones via the FAA as the hobby continues to soar and captivate newcomers. What’s interesting is the segmentation of drone sizes and capabilities. For example, the small size of DJJ’s Spark ‘selfie drone’ combined with gesture control makes it ideal to take pictures of oneself posing alone or with friends. Gesture control is the spawn of clever drone expansion and manufacturer marketing. 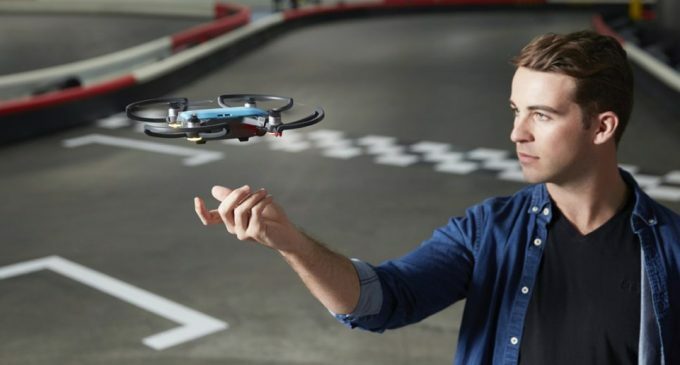 As drones take off with consumers, manufacturers want to put affordable and fun models online. DJJ’s Spark model is the world’s first gesture-controlled drone. Even better, it’s the size of a soda can, making it more affordable and less intimidating. Consult the Dronethusiast list of the best drones to find the right model for your intentions. Gesture control technology is not limited. The car industry seeks to adopt such features in the near future. Rather than turning knobs or pressing buttons, a driver will swipe their hand to change music stations or get directions. Of course, any drone flyer can double as a money maker, using their drone to take still shots and video footage. What use do drones serve? Drones take overhead shots of surfing competitions, provide ocean-side hotels and inns with advertising material, and capture wildlife in a “wild” state. It could be lucrative to start adding gesture control to your flying skill set. People love taking selfies as established by the number of pics uploaded to the internet and shared with family and friends on social networks. The selfie stick was created for the sole purpose of capturing such images. But, per the selfie pose, there is always a need to extend an arm to take the shot. Imagine simply “drawing a square around your face” as your drone targets, focuses, and takes a quality, high definition image. A few years ago, MIT researchers toyed with the notion of gesture control and had aspirations to apply it to large aircraft such as planes and jets. An air traffic controller could literally do so given a range of motions detected by a craft. A drone’s ability to accurately interpret a range of motions (commands) poses challenges for manufacturers as the industry technology evolves.